No one expected the 2016 Yankees to be any good. And they weren’t. They got off to a 9-17 start, and it was obvious they had to tear apart the team and play prospects, and by this time every fan wanted them to do just that. Free agency had been the Yankees’ strategy since the early 2000s and a way for the team to plug holes on their sinking ship. It worked at times as they were able to tread water, have winning seasons and reach the playoffs, but over the previous 15 years, they had won one championship. Eventually you need to start over. Eventually you need a new boat. The game had changed too much and the Yankees needed a new boat and Yankees fans wanted a new boat. At the end of play on July 6, 2016, the Yankees were 41-43 and it looked like they would certainly be sellers at the deadline in three weeks, but ownership wasn’t on board. The Yankees then went on an 11-5 run through July 26, and were now in striking distance of a wild-card spot — only four games back — and ownership hadn’t budged on selling and giving up on the season for future seasons. The Yankees then lost their next four games, one in Houston and a three-game sweep in Tampa Bay. It was the best thing to happen to the organization since the Astros, Indians, Expos, Orioles and Reds passed on Derek Jeter in the 1992 draft, allowing the Yankees to select him with the sixth-overall pick. The losing streak pushed the Yankees out of reasonable contention, ownership gave Brian Cashman the green light to trade his veteran assets and begin the transition into “rebuilding mode”. Andrew Miller (Indians), Aroldis Chapman (Cubs), Carlos Beltran (Rangers) and Ivan Nova (Pirates) were all traded, and Alex Rodriguez and Mark Teixeira announced their retirements. Gary Sanchez and Aaron Judge were called up to become everyday players, and in the process, Brian McCann was relegated to backup duty, which would lead to his offseason trade to the Astros. The Yankees had finally decided to show off the depth in their farm system, and thanks to that four-game losing streak at the end of July, the depth only got deeper with the top prospects they received in return. The 2017 Yankees weren’t supposed to be good either, picked by many to finish near or at the bottom of the AL East in what was certainly going to be a rebuilding season. But there ended up being no “rebuilding”. The Yankees seemingly hit on every prospect who reached the majors and the team went from preseason dud to postseason bound, winning 91 games and putting up a plus-198 run differential. The 2017 Yankees overcame a 3-0 first-inning deficit in the wild-card game. They overcame an 0-2 series hole to the 102-win Indians to advance to the ALCS. They overcame another 0-2 series hole to the Astros to bring a 3-2 series lead to Houston for Games 6 and 7. Ultimately, they came one win shy of reaching the World Series for the first time in eight years. For 2018, the Yankees essentially replaced Chase Headley, Starlin Castro and Jacoby Ellsbury with Giancarlo Stanton (the reigning NL MVP), Miguel Andujar, Gleyber Torres and the Aaron Hicks who was drafted in the first round. But once again, they came up short in the postseason. The 2017 postseason loss wasn’t crushing. Rather it was an exhilarating ride, being back at a raucous Stadium seemingly every night in October and watching a young, homegrown core get within a game of the World Series. The 2018 postseason loss, on the other hand, was crushing. 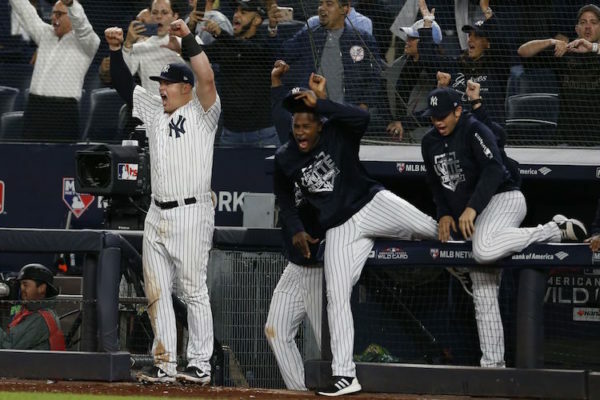 After once again winning the wild-card game, and taking a game in Boston, the Yankees became the favorite in what had become a best-of-3 with two games at the Stadium where they didn’t lose. Not only did they lose both, they were embarrassed in every facet of the game, especially managing, and their rival celebrated on their field en route to a championship season. Because of the way the season ended and the team it ended against, 2018 is viewed as a disaster, and rightfully so. But if you go back to 2016, 2017 and 2018 were never supposed to be about the Yankees. They were supposed to be about the Indians and Astros and Red Sox and Cubs and Dodgers, and they were. The timeline Yankees fans were given and expected prior to Opening Day 2016 was always 2019, these Yankees just happened to arrive early. The 2017 and 2018 Yankees gave us two unexpected years of championship contention even if it didn’t end with a championship. It’s nearly impossible to predict who will and won’t perform in the postseason, with the goal being to get there and then hoping things go your way. The Yankees are built to get there even if they exceeded the luxury tax only to not sign either of the two 26-year-old generational stars or the top pitcher on the free-agent market. The optimal way to get there and succeed is to avoid the wild-card game, which the Yankees have played in back-to-back seasons and three of the last four. That can’t happen again. No more coming up short in the regular season. No more one-game playoff to decide the team’s fate. The grace period with these Yankees is now over. This season is the first season of the window of opportunity for this core to win a championship or championships. There’s no more consolation prize for coming within a game of the World Series or winning 100 games and then getting blown out by your storied rival. There’s no more excuses and no more “Next year”. These Yankees were expected to truly contend in 2019 and 2019 is now. The championship grace period is over. It’s long over. This October will be 10 years since the Yankees last reached the World Series and last won it. From here on out, every season with this group which doesn’t end with a championship will be a missed opportunity.